This is Ziggy Crews 54th cache hidden. And Our Fourth Puzzle Cache. Cachers That Completed The Challenge! In 2004, A cacher named Haicoole unveiled the first ever DeLorme Challenge called "California DeLorme Challenge". This popular challenge cache has since been repeated and enjoyed in many other states to many to mention. Except New York. The image above shows the geographical extents of each of the pages of the New York DeLorme Atlas & Gazetteer. The final cache coordinates can be obtained by successfully finding a cache on each page of the Atlas. 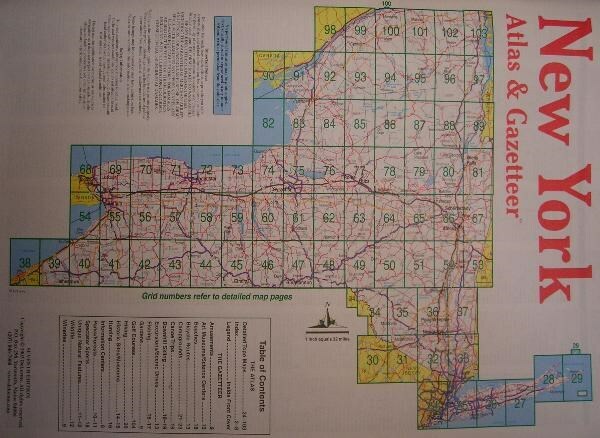 The Delorme Atlas and Gazetteer, pictured below, is published for all 50 states. 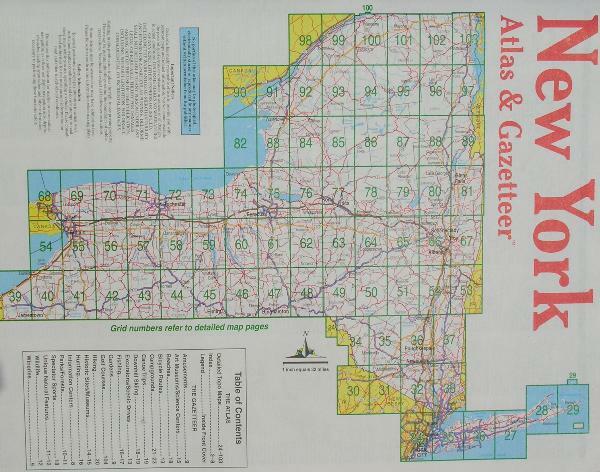 These Atlas's contain topo maps of the state. Along with information on trails, recreation areas, campgrounds, rivers, lakes, hunting and fishing, scenic drives, and as well as state attractions. They can be found at all major retailers, travel centers, some service stations and as well as directly from Delorme. The coordinates above do not bring you to the cache location. 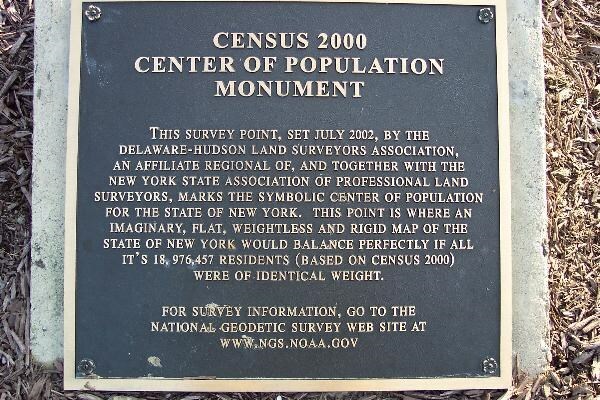 But they do bring you to an Orange County Park where the 2000 Census Population Center of the state is. The final cache location is also in this park. It is pad locked closed and you will recieve the combination and coordinates when you complete the challenge. The cache is a .30 cal ammo can that is stocked well with some really nice stuff for those who complete the challenge. I DARE YOU TO COMPLETE THIS CHALLENGE! The posted coordinates above are bogus, and to get the actual cache coordinates, you must first complete the challenge. In order to claim this cache, you must first bookmark all of your qualifying hides and finds (I only need 1 from each grid). The bookmarking must contain in this order - Grid #, GC Waypoint #, Log Date, and cache name. This will help speed up the verification process. Only cache "Finds" and or "Personal Hides" as of January 1, 2006 and later (giving you 1 full year before the posting of this cache) will be allowed to help you in this challenge. I will review the list in order to verify the caches. Once everything checks out, I will then send you the correct coordinates for the final cache! The find cannot be logged until the physical container is found and the logbook inside signed. Caches "Found" or "Personally Hidden" prior to the posting of this page, but not before January 1, 2006 to the creation of the New York's DeLorme challenge will count only as long as all other Challenge requirements are met. Deleteing any logs of previous FOUND caches on any page that are before the allowable start date and relogging them inside the time frame is absolutly NOT ALLOWED! And if I am informed of this by the cache owner, I will reject your submission and I WILL NOT give you the coordinates to the final location, EVER! If a page of the New York DeLorme Atlas & Gazetteer does not contain a cache at the time that you have completed the challenge and submitted your list, then you may place a cache in that area to meet the requirement. Any hides must meet Groundspeak requirements regarding vacation caches; in other words if you can not maintain the cache then you must provide the name of another person who is willing, and is able, and will actually do it for you. Only caches with physical containers and logbooks, no matter when they where hidden, will count in the New York's DeLorme Challenge. The listed coordinates on the cache page will be the coordinates in determining where the cache is placed and what page it falls on. Sorry, but Event, CITO, Earth, and Virtual caches will not be allowed in this challenge. If a New York DeLorme Atlas page includes space not located in New York, only caches in the New York portion will count. This means page 38, which does not have any portion of New York on that page, is excluded. On pages consisting of multiple map blocks, except page 34, only 1 cache must be found for each page, not each map block. On page 34, you are required to find a cache for both maps. A total of 80 cache finds will be required to complete the New York Challenge. While you may have others with you when you find the final cache, only those who have fulfilled ALL criteria for this cache will be allowed to log it as a find. Find logs by other cachers will be deleted. No Exeptions! Online cache logs of the caches that you find should include a statement, "Found as part of the New York's DeLorme Challenge". I'd appreciate it if you would consider editing logs to include this statement on finds made prior to the challenge start and are being used to complete the challenge. I have been informed by cache owners that cachers attempting to complete this challenge have deleted previous logs that date before the allowable start date of this challenge and then relogging inside the time frame in order to be able to claim a find on a certain page. This would be CHEATING! If this is true, and a cache owner notices this on their cache page and wonders why the logger has done so, Please email me the cachers name and I will be sure to REJECT their submission. 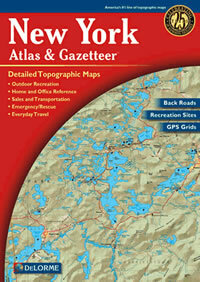 NOTE: It has now been almost a year since the Sixth edition of the New York DeLorme Atlas has come out. It seems that it is becoming more difficult to find the older edition. So in fairness to everyone I will now offer everyone a choice of which edition you choose to use. If you have already started the Challenge using the older edition or you can obtain a copy of the fifth edition, continue to use it. If you cannot get your hands on the older edition you can use the 2011 version. I’ll accept either one. The same rules apply as stated above but if you use the newer edition you will need to find more caches. When you submit your bookmark list let me know which edition you used. Pbzcyrgr gur punyyratr naq V jvyy uryc lbh! White Jeep Travel Bug "Harper"